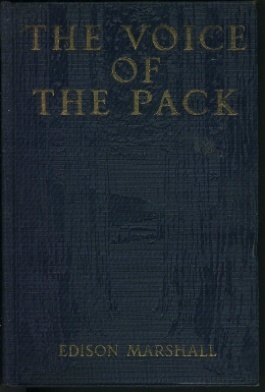 "The Voice of The Pack", by Edison Marshall, Published by A.L. Burt Company, New York by arrangement with Little, Brown and Company. Copyright 1920 by Little, Brown and Company, All rights reserved, Published, April 1920, Reprinted, May, 1920. With frontispiece by W. Herbert Dunton. 305 pages. Hard covered book.